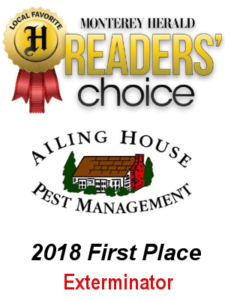 We thank you for voting for us...Monterey Herald - Reader's Choice - Best Pest Exterminator | Ailing House Pest Management, Inc.
On behalf of the Ailing House Pest Management team, we would like to thank the readers of the Monterey Herald and all of our clients for having the honor of being selected number one for the Reader’s Choice award for Best Exterminator! We believe our experience, expertise, and dedication are the secret to our success, and we thank you for your vote and generous support over all the years, and look forward to serving you for many more to come. Need help with a pest problem?